A University of Strathclyde spin-out company that’s raised two funding rounds from FTSE100 giant Croda International is poised to unveil its prototype technology next week at the In-Cosmetics Global trade show in Paris. Cutitronics has created a suite of patented technologies and software that can analyse a customer’s skin and then dispense exactly the right amount of beauty products and cosmetics for their specific need. The device and accompanying smartphone app can be tailored to suit any brand, giving skincare and cosmetic companies the chance to create a bespoke package to suit each customer’s skin. Cutitronics’ disruptive technologies are poised to usher in an age of personalised skincare, allowing brands to bring the scientific rigour of clinical studies into customers’ homes by receiving feedback from users and measuring the results on the health of their skin. Dr David Heath, Founder and Chief Executive at Cutitronics, explained: “Our CutiTron technology is like a Fitbit for the skin – it opens the door to personalised skincare for brands and their customers. 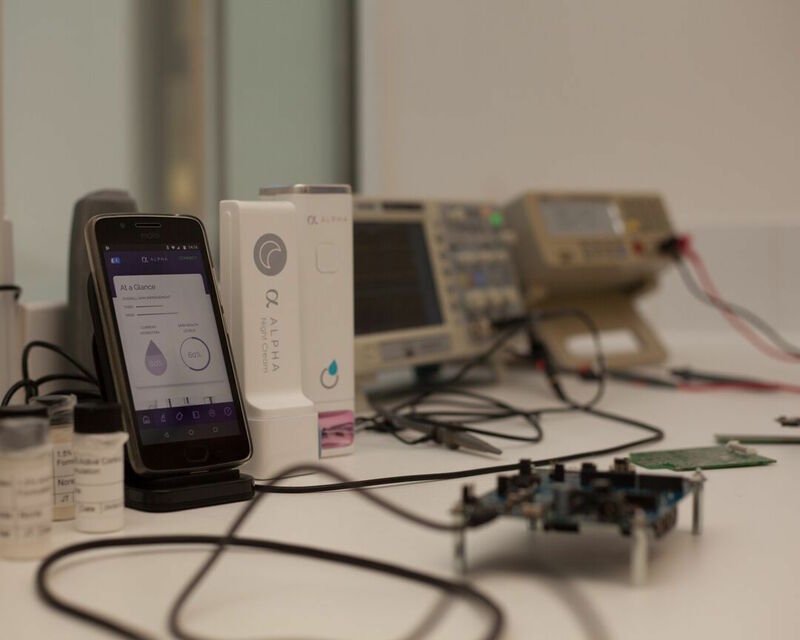 “Our prototype can analyse the hydration of a customer’s skin and draw on a wide range of external information, such as their location, the outside temperature and the humidity in the air. “It can then recommend and dispense the right amount of a product that the customer should use on that particular day to get the best results for their skin. Dr Heath added: “This is just the tip of the personalised beauty iceberg – our technologies can be tailored to offer different services for different brands. “As well as dispensing the brand’s products to their customers, our technology can also gather information that the customer can choose to send back to the brand. “That data can be invaluable to help brands improve their formulations or learn more about their customers’ skincare routines. As part of his doctorate and subsequent research work in biomedical engineering at the University of Strathclyde, Dr Heath investigated how drugs could be delivered through the skin. His investigations led him to realise that the same principles could be applied in the beauty and cosmetics industry, which has previously relied on chemistry for its innovation. Sandra Breene, President of Personal Care & North America at Croda, which creates, makes and sells speciality chemicals for some of the world’s biggest and most successful brands, and a Non-Executive Director of Cutitronics, said: “David and his team have created a really innovative technology that’s going to disrupt the beauty market. “This is a great opportunity for brands to partner with Cutitronics and produce white label devices and apps that will strengthen those brands’ relationships with their customers. 2008 - 2019 © Hot Tin Roof. All rights reserved.